Fitted with a very bright 60mm LED matrix display and IP68 stainless steel case. CE-M approvable (OIML R-76 / EN 45501). Power supply from 110-240 Vac. PROFIBUS bidirectional port (DGT60PB3GD model). 2 MOSFET 150 mA 48 Vac / 150 mA 60 Vdc (NO) outputs, with configurable functions. 16-bit analogue output (DGT60AN3GD model) 4-20mA / 0-5Vdc / 0-10Vdc at choice; maximum applicable voltage: 350 Ohm; minimum applicable voltage resistance: 10 kohm. 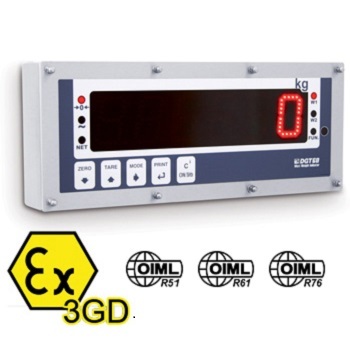 DGT60BC3GD-1 ATEX 3GD weight indicator with 60mm LED display. IP68 stainless steel case and 5-key keypad. Protection mode: ATEX II 3G Ex nR IIC T6 Gc X for gases and ATEX II 3D Ex tc IIIC T85°C Dc IP68 X for dust. Complete with manual and ATEX CE conformity declaration (available in EN, DE, FR, IT). DGT60AN3GD-1 ATEX 3GD weight indicator with 60mm LED display and analogue output. IP68 stainless steel case and 5-key keypad. Protection mode: ATEX II 3G Ex nR IIC T6 Gc X for gases and ATEX II 3D Ex tc IIIC T85°C Dc IP68 X for dust. Complete with manual and ATEX CE conformity declaration (available in EN, DE, FR, IT). DGT60PB3GD-2 ATEX 3GD weight indicator with 60mm LED display and Profibus. IP68 stainless steel case and 5-key keypad. Protection mode: ATEX II 3G Ex nR IIC T6 Gc X for gases and ATEX II 3D Ex tc IIIC T85°C Dc IP68 X for dust. Complete with manual and ATEX CE conformity declaration (available in EN, DE, FR, IT). 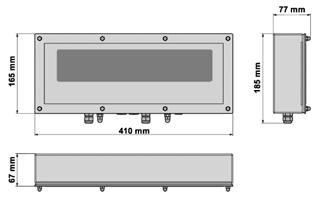 DGT60R3GD-1 ATEX 3GD weight repeater with 60mm LED display. IP68 stainless steel case and 5-key keypad. Protection mode: ATEX II 3G Ex nR IIC T6 Gc X for gases and ATEX II 3D Ex tc IIIC T85°C Dc IP68 X for dust. Complete with manual and ATEX CE conformity declaration (available in EN, DE, FR, IT).